Diversity and Inclusion has gained both support and momentum across the TDS organization in the last couple of years—and we have a new award to prove it. The latest is TDS Telecom winning the Diversity Advocate Award by the Wisconsin Society of Human Resource Management (SHRM). This comes the same year that TDS Inc. was named to Forbes’ America’s Best Employers for Diversity. In Diversity and Inclusion work, it’s as important as ever to get an outsider’s perspective. With that, take a moment to read what the Wisconsin Chapter of SHRM had to say about the great work being done at TDS. The Wisconsin Council recently announced TDS Telecom of Madison, a company of 3,400 employees, as the recipient of their 2018 Diversity Advocate Award. TDS was presented their award on October 12 during the recent Wisconsin SHRM State Conference held at the Kalahari Resort in Wisconsin Dells, Wis. The award was accepted by Patrick Yates manager of Diversity and Inclusion and Kathy Cefalu, vice president and Chief Human Resource Officer. The award is given annually to an organization that has been a role model within their local community as a strong organization advocate for diversity, inclusion and workplace flexibility. TDS demonstrated the seriousness of advancing their diversity efforts by appointing a full-time Manager of Diversity and Inclusion, Patrick Yates. 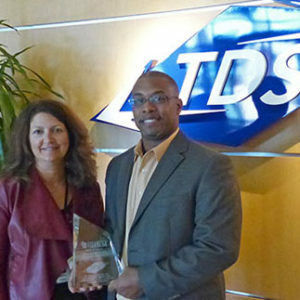 TDS has also demonstrated their commitment to advancing diversity and inclusion within their community. Rather than offering monetary resources to a non-profit organization, a contribution of people resources was lent to the Nehemiah Community Development Corporation’s Justified Anger Initiative. TDS allowed 60% of an employee’s time to address racial disparities for a year, spending three days a week within the Madison community. They also allow every employee 16 hours to volunteer their time at other approved community organizations. 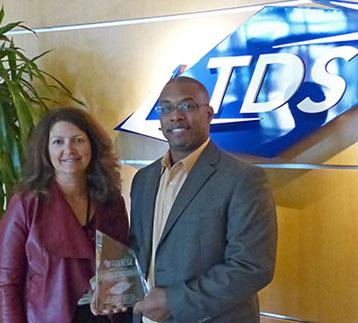 The Wisconsin State Council SHRM is proud to recognize TDS Telecom for its work in displaying the ideals of which the award represents in diversity, inclusion and workplace flexibility. The formation of Employee Resource Groups has been incredibly important in achieving the Diversity and Inclusion goals set by Yates, Cefalu and Leadership. The Patriot Group: Growing outreach to support military and Law Enforcement-oriented groups within local communities and at TDS. Women in Technology: Recruiting, retaining, and developing women in the Science, Technology, Engineering and Math (STEM) fields. 2BU: Fostering a sense of community within and outside TDS by valuing differences, providing educational opportunities, and helping LGBTQ+ employees succeed. Our Heritage: Promoting and educating employees by giving them a seat at the table, engaging multi-cultural communities, and raising cultural awareness and competence. Emerging Professionals: Connecting emerging professionals through professional development, charitable events, and networking opportunities. Intern: Providing resources for development, opportunities for internal advancement, and forums to connect with one another.